The best Open Houses have buyers lingering . . .
You know someone is pretty interested in a home when they’re hanging around and don’t seem to want to leave. That’s what happened at my Broadview Open house this weekend at 12215 9th NW. The home is one of those “fall in love” types of places with a sweet garden. The feeling inside is casual, so when you’re there you tend to want to stay awhile. We had over 60 groups come through, and we noticed that some groups tended to linger. Watching them wander through the home and garden, they’d return with a question about one area or another. They were collecting information about how this home might be the one that checks off all the boxes on their list. When you feel like a home is the place for you, you tend to get a gut instinct almost immediately after walking in the front door. It is probably a combination of light, space and vibe, but in real estate lingo it translates to the layout of the home, the interior color palate, the natural light and indoor/outdoor flow. If you have ever walked into a home, be it for sale or perhaps when you were visiting a friend, and you just physically felt your shoulders relax, and when you sat down you thought I’ll stay a bit longer, that is the effect that a really happy home has on buyers, or even neighbors for that matter. 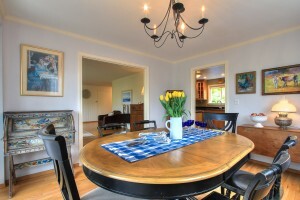 The best Open Houses have buyers lingering, and it is a pleasure to represent a home with that special magic.